There’s a reason that Savage and Son has been in business in our community for 125 years. We have proven to generation after generation of northern Nevadans that our team and our work can be counted on. We take pride in providing quality products and customer service at a fair price. 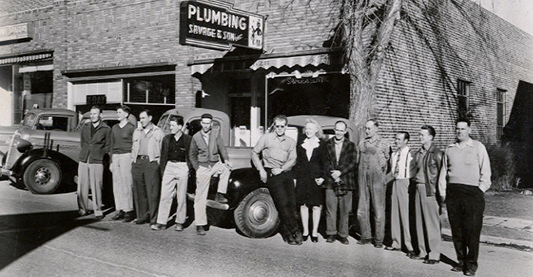 We have been the leader in the plumbing industry in northern Nevada for the past century. We have no interest in shortcuts. We are a company that builds lasting relationships with our clients through our quality workmanship and our commitment to getting the job done right. Our journeyman plumbers are knowledgeable and efficient while taking pride in completing the job correctly the first time. From drain cleaning to faucet repair to major remodeling, Savage & Son can handle all your plumbing needs from the most modest residential repair to the multi-million dollar commercial projects. We value all of our customers and are excited to show you what we can do for you. The Savage family traces its local roots back to Leonard Coates Savage in Virginia City in 1859. Leonard was highly involved in helping to pipe water out of the silver mines in Virginia City. The former Pony Express rider was looking for wealth in the silver mines, and nearly found it. Unfortunately, he wasn’t able to afford development of the Savage mine, and he found himself in a gambling hall dealing his claim to some bankers from the Bay Area in exchange for seven ore claims on Peavine and a white horse named Shakespeare. It turns out that the claim Leonard dealt became one of the most lucrative claims on the Comstock. Leonard’s luck in the gambling hall didn’t turn the Savage family into millionaires, but it did propel them to be the family that they are today – valuing hard work, ingenuity, loyalty and character. Success wasn’t something that could be dealt in a gambling hall one night, but rather earned, daily. Leonard’s son, Frank Charles Savage, established Genesy & Savage Plumbers and Tinners in Virginia City, and in 1893 moved to Reno to create his own plumbing business – located behind the Wigwam coffee shop on Sierra Street (one block South of the El Dorado Hotel / Casino). The company repaired everything from steam boilers to walk-in refrigerators on ranches. The company grew rapidly along with the growth of the Biggest Little City. In 1941, then owner, Leonard Charles (Frank Charles’ son) moved the storefront location to South Virginia Street (just south of California Ave., where Michael’s Deli currently does business). The family thought that that Leonard was crazy for moving “so far outside of Reno.” Of course, Reno has far expanded its city limits past the 1941 location. A member of the Savage family has been running the company every single day since its creation more than 125 years ago. Savage and Son plans to continue to be a very present and contributing member of our community, for generations to come. Savage and Son, Inc. is a full service Plumbing, Heating Ventilation Air Conditioning (HVAC) and Industrial Piping Mechanical contractor for residential, commercial, and industrial projects. We specialize in both commercial and industrial projects, offering the proven reliability of the past and the innovation of the future. From commercial fabrication to high purity piping installations, even sewer roding and cleaning, one call does it all. We have performed on the most demanding and complex projects in the Northern Nevada and California areas and provide lasting relationships with our clients by providing quality workmanship, efficient scheduling, safe and professional employees, and value and efficiency for your project. Savage and Son has all of the necessary licensing, as well as a wealth of experience, to assure you of the qualifications to do a great job on your project. We are licensed in California and Nevada. Please contact us for more information about any of our qualifications.